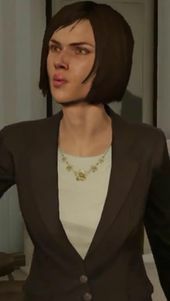 Debra is a character in HD Universe who appears as a minor character in Grand Theft Auto V. She is voiced by Claire Byrne. Debra is the fiancé of Floyd Hebert who is away on a business trip when Trevor Phillips and Wade Hebert arrive from Blaine County and take over her apartment while Floyd is watching it. During Trevor's stay, the apartment is completely trashed with faeces being spread over the apartment after Wade returns from working at the Port of Los Santos and a framed photo of Debra is broken by Trevor. Floyd later puts the apartment back together, with the exception of Mr. Raspberry Jam, when Trevor goes into hiding. Trevor later returns to the apartment but finds that Debra has returned from her business trip. Floyd confronts Trevor outside the apartment but Trevor kicks the door down, terrifying Debra. She demands that Trevor leave, and when he refuses to do so, while begging Floyd and Debra to take turns with Trevor, she draws a pistol towards him while Floyd draws a knife. Trevor then states that Floyd and Debra are not very nice people. As Trevor leaves the apartment covered in blood, Wade shows up to visit his cousin. Not wanting to reveal that he killed Floyd and Debra, Trevor takes Wade to the Vanilla Unicorn, keeping him distracted with nonstop lap dances. Debra may be having an affair on Floyd with a man named Bob as stated in the mission Hang Ten. This page was last modified on 22 August 2014, at 13:55.